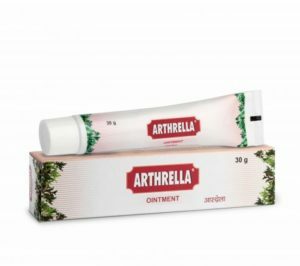 Arthrella ointment is made up of herbal remedies that help in osteoarthritis pain relief. It provides quick relief from symptoms of rheumatoid arthritis. It is also an excellent natural remedy for frozen shoulder pain relief. The natural herbs in this product help to nourish the joints and provide relief from joint pains. It is an excellent alternative treatment for getting relief from rheumatoid arthritis, osteoarthritis and frozen shoulder pain. There are no adverse effects of applying this remedy regularly as it helps to support the normal functioning of your joints. It provides natural support to the joints and enhances your joint movements. It is also a very good remedy for reducing pain and swelling of the joints. It helps in reducing inflammation of the joints. It reduces swelling and redness of the joints. It is a suitable remedy for the people of all ages. It may be applied regularly on the affected and painful parts of the body to get quick pain relief. It consists of natural herbs that help to increase the mobility of the joints. The herbal remedies also reduce stiffness and pain in the joints. It is a natural remedy for joint pains and is useful for the people suffering from osteoarthritis, rheumatoid arthritis and frozen shoulder pain relief. It reduces the inflammation of the joints and helps in reducing swelling and redness of the joints. It may be applied regularly to get rid of stiffness of the joints. It is also a useful natural product for reducing pain in any part of the body. It increases the strength of the joints and helps to restore normal functioning of the joints. The natural herbs in the ointment help to enhance the blood circulation to the affected area and helps in reducing swelling and pain. Take out a small amount of ointment on your finger and rub it gently on the affected part. Massage it slowly two or three times in a day to get instant relief from pain and swelling of the affected joint. Camphora officinarum, Mentha piperata, gaultheria fragrantissima and Capsicum annum: These are natural herbs that reduce pain and inflammation of the joints and give instant relief from pain and swelling. These herbs also provide quick frozen should pain relief. Nyctanthes arbortristis, Oroxylum indicum, Withania somnifera, Curcuma amada, Vitex negundo: These are natural herbs that help in reducing pain in the joints. The herbs provide nutrients to the joints and help in restoring the strength of the joints naturally. Nux Vomica and Hyoscyamus Niger: These natural herbs act as analgesic and reduce pain quickly. It may be used on a regular basis for getting relief from swelling and inflammation. Arthritis is inflammation of one or more joints. Arthritis affects thousands of people all over the globe. A patient suffering from arthritis experiences acute and recurrent episodes of pain and inflammation. It is a chronic condition which affects the movements of the body. Arthritis affects various joints of the body and cause symptoms like pain, stiffness and difficulty in moving the joints. Allopathic treatments do not provide cure for arthritis and only gives temporary relief. The use of natural therapies among arthritis patients is on rise due to their safety. Natural therapies offer long term results without producing any side effects. How to get relief from symptoms of rheumatoid arthritis? Ginger tea is a very effective remedy for getting relief from inflammation of the joints. It helps in reducing pain and swelling. Ginger is believed to have anti-inflammatory properties that prevent recurrent infection of the joints. Turmeric is also found to be an effective remedy for reducing pain and swelling of the joints. You can add half a teaspoon of turmeric powder in a glass of hot milk and drink it daily. It helps in reducing pain and stiffness of the joints. Eat a well balanced diet to provide proper nutrition to the bones and joints. People suffering from joint pains should reduce protein intake as it can aggravate the pain. Drink more water to remove the toxins and chemical substances from the body. Water also helps in reducing swelling of the joints. Take one teaspoon of fenugreek seeds and soak them in water. Keep overnight and grind the seeds in the morning and eat them daily for reducing pain and stiffness of the joints. Exercise also increases the strength of the joints. People suffering from rheumatoid arthritis and osteoarthritis can do mild exercise to reduce the pain and swelling of the joints. Drumsticks are also believed to be useful for the treatment of osteoarthritis and rheumatoid arthritis. You can boil a few drumsticks in water and strain it. Drink the water daily two or three times in a day.